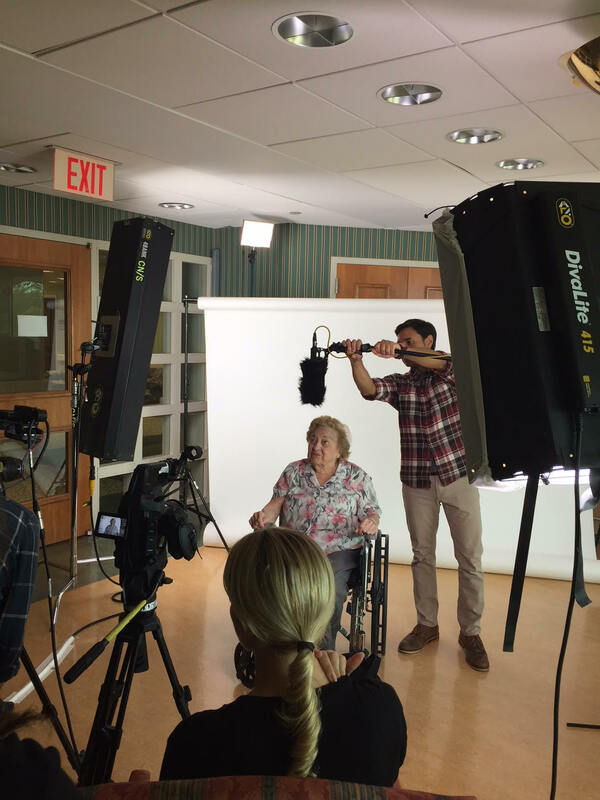 How did this patient hear about The Paramount at Somers? Communication with case manager. Mr. Steven Casado entered Hudson Valley Hospital Center on December 17th, 2018, for a laparoscopic appendectomy complicated by pulmonary edema and ARDS (Acute Respiratory Distress Syndrome) which resulted in requiring mechanical ventilation. Previous to hospitalization, he was living at home with his parents and employed at the Veterans Administration in Montrose, New York. 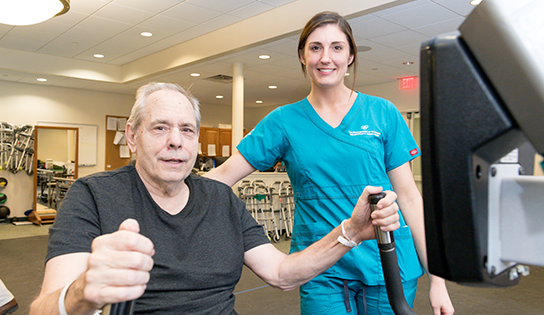 Steven was referred by the hospital case manager and came to our community, The Paramount at Somers Rehabilitation and Nursing Center, for rehabilitation therapy for muscle weakness to regain his strength, balance, mobility, and functioning so he can return home. Upon evaluation from physical therapy, he was unable to ambulate. He was transferring at a minimum assistance (Min A) level from his wheelchair to bed, on all surfaces, and needed extensive assistance with rolling side to side, supine to sitting and sitting to supine. He was unable to support himself via dynamic balance and needed a rolling walker to stand upright. One of the most important obstacles that Mr. Casado needed to overcome was to successfully complete walking 10 steps so he could get into his house. In addition, he could not be safely discharged home with a wheelchair since his home is not set to any Americans with Disabilities Act compliances/standards. Moreover, when evaluated by occupational therapy, he had a decreased ability to perform lower body dressing, complete toilet transfers and standing to complete hygiene and grooming and standing for all activities of daily living (ADLs). He also had decreased mobility secondary to neuropathy in feet, foot drop and overall weakness due to his recent surgery. Steven progressed through three distinct stages of treatment and intervention. During week one, Steven worked on standing, walking, reaching exercises, and ADL exercises. He also was given bilateral ankle-foot orthotics (AFOs) to assist with his foot drop. In addition, he was given electronic stimulation (E-Stim) therapy to passively contract and strengthen his leg muscles. During his second week, he became more medically stable and made improvements to include: ambulating with a rolling walker, standing with a rolling walker using one hand to balance and successfully completing lower body dressing. During his third week, he was able to ambulate with moderate independence with AFOs in place, improve balance further to using one leg, and was able to climb stairs. Steven worked really hard in his therapy sessions, working on standing, walking, and reaching exercises. During this time his progress was slow but steady. He continued with his exercises as prescribed by his therapists in between therapy sessions. Steven was fitted with bilateral ankle-foot orthotics which greatly improved his foot drop. Aside from therapy, Steven was anxious to make sure he was eating correctly and managing his diabetes. Julie, the patient concierge, partnered with dietary and nursing to ensure his food preferences were met and his medication regiment was explained to him to make him feel more at ease. During this time, Steven’s medical condition became more stable and was able to progress to begin walking with a rolling walker. His balance improved as he was only holding on with one hand and was able to complete lower body dressing on his own. While seated, he was able to dress himself completely unassisted. Steven was determined to follow through on his therapists’ plan of care set out for him daily. During his last week, Steven made the greatest progress toward his rehabilitation goals. He progressed to walking with a rolling walker with modified independence. His balance improved to standing on one leg with minimal upper extremity support. He was walking around The Paramount with modified independence by using only his walker or wheelchair as an assistive device. The major success was revealed when Steven was completing more than five sets of twelve 8” steps and was able to be discharged home safely without the use of a wheelchair. He has successfully been able to get himself upstairs, is able to take a shower unassisted, and most importantly -he is able to safely attend his appointments and outpatient rehabilitation now all independently. Post discharge, Julie reached out to Steven to see how he was transitioning back home. Steven shared he was keeping up with outpatient therapy and exercising at home. He was grateful for the support he received at The Paramount. Steven was very happy with this stay. He also shared and if he had to come back, he wanted Kamal (Charge Nurse), Michael (CNA) and Renee (CNA) to take care of him. They made sure his stay a good one. In conclusion, Steven is a perfect example of how commitment, hard work and determination can help you to succeed in your rehabilitation goals. It is at the core of the CareRite mission to provide and foster unprecedented levels of Rehabilitation and Nursing needs to our patients. All made possible by our caring and committed healthcare professionals to get our patients back to their fullest potential. The Paramount at Somers Celebrates Heart Health Month! Our community was proud to partner with Chiquia Mayhew, PA-C, of the New York Presbyterian Cardiology Department for this year’s heart health seminar! Chiquia served as our keynote speaker, sharing education on heart disease; the warning signs and preventative measures. We were proud to welcome our friends and families from the community and share this day of learning and inspiration. Posted in News and Events	| Comments Off on The Paramount at Somers Celebrates Heart Health Month! Mr. Theodore Marsek, (Teddy) is a 71-year-old man who was admitted to Putnam Hospital with admitting diagnoses of muscle weakness, abnormality of gait and mobility, confusion. Previous to infection, patient was living at home with wife, was self- ambulating and functioning independently and oriented. Patient was referred and admitted to The Paramount at Somers Rehabilitation and Nursing Center for rehabilitation therapy for muscle weakness to regain his strength and functioning and return home. Teddy was alert and oriented at times and confused and delusional at other times. He exhibited hallucinations, was combative, easily agitated, had aggressive behaviors toward staff and would have periods of lethargy throughout the day. When he was initially assessed, he was able to follow only simple 1-step commands and directions with some attention-procession difficulties noted. He was able to only make basic needs known to staff. During this time he was at a high risk for falls. Patient was unable to walk or self-ambulate in his wheelchair. He had a poor tolerance for treatment and was able to maintain a 30-45% carryover from his therapy. He required tactile and verbal cueing with Moderate to Contact Guard Assistance for Activities of Daily Living, functional mobility using wheelchair and rolling walker and transitional movement. Teddy required ongoing encouragement and motivation to engage in treatment sessions. Patient was provided attention processing techniques to engage in meaningful tabletop activities. His therapist was able to get him to manipulate nuts and bolts for fine motor coordination. He was provided basic Activities of Daily Living, retraining which included: upper body dressing, hygiene and grooming, toileting with transfers. His therapist also worked on task segmentation, sequencing, and exercise to improve his overall strength and endurance and activity tolerance. Mr. Marsek had a decrease in his confusion; he was no longer hallucinating and was less agitated. He had improvements in cooperation; he became more energetic and less fatigued. He progressed to following multi-step commands to remain on tasks in therapist without cueing. He uses his wheelchair for functional mobility and rolling walker during rehabilitation session. He was able to better tolerate treatment and progressed to having 50-75% carryover on skills in therapy. Teddy continued to receive training for Activities of Daily Living, dressing, hygiene toileting and grooming. He received further training with safety techniques and strategies to reduce risk of injuries and falls. He also worked with his therapists on neuro reeducation on basic proprioceptive awareness, grasp release, static/ dynamic/ sitting and standing. He improved his fine motor skills with therapists by zipping and fastening his clothing. Lastly, he participated in range of motion exercises, bending and strengthening techniques to improve functional task performance. Teddy was more cooperative, motivated and pleasant. He tolerated treatment and interventions well with 80-100% carryover. He has progressed to supervision to moderate independence. He trained with therapists on functional activities to increase strength, range of motion, flexibility, core strengthening and endurance exercises. To prepare for discharge, Teddy and his spouse were provided education on proper bracing, body mechanics, compensatory techniques, energy conservation and safety to ensure a smooth transition home. On Friday, December 14, Mr. Teddy was discharged home to celebrate his return with his wife and family. His ambulation status progressed from non-ambulatory to walking with moderate independence upon discharge. His cognition has improved to being fully aware of person, place and time. Of skills learned in therapy upon discharge, he was retaining 80-100% carryover. He progressed to no falls upon discharge. Lastly, he has had a complete turnaround with his mood and behaviors. He progressed from agitation and aggression to being cooperative, motivated and pleasant. Teddy has truly experienced a complete transformation from when he admitted to the Paramount to now. He has improved in nearly every domain physically, cognitively emotionally and spiritually. Teddy is a prime example of how hard work, committed staff, perseverance and a positive attitude can accomplish amazing things! It is at the core of our mission to provide and foster unprecedented levels of Rehabilitation and Nursing needs to our patients. All made possible by our caring and committed healthcare professionals to get our patients back to their fullest potential. 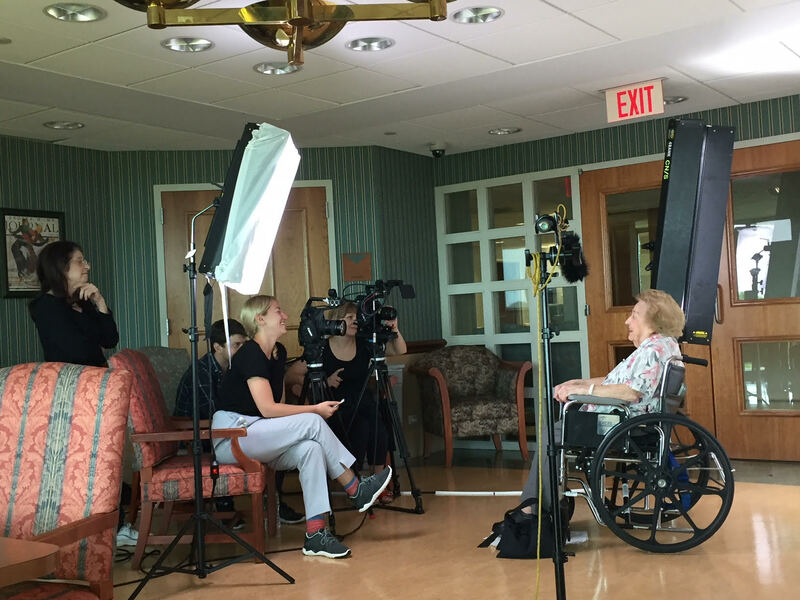 Ms. Maren Dochtermann arrived at The Paramount at Somers (at that time Somers Manor Rehabilitation and Nursing Center) on December 15, 2017, from Westchester Medical Center in Valhalla, New York. Ms. Dochtermann came to us with CVA, R MCA thrombectomy, R ACA infarct, and L hemiplegia. She was in acute rehab as of November 2017, and then they referred her to us for short-term rehabilitation. Within the first 48 hours of arriving at our community, her physician (our Medical Director), nursing, social work, therapy (physical, occupational, and speech), administrative staff, and more greeted Ms. Dochtermann. At the point of admission, Ms. Dochtermann was dependent with all ADL’s. She had left side hemiplegia. Her pain was an eight out of ten while moving and a five out of ten when still. Ms. Dochtermann suffered impairment in balance, sitting endurance, poor trunk control on her left side, and her fine and gross motor skill coordination was impaired. Cognitively, she had difficulty following directions, impaired sense of time and tendency to loop. For the first quarter of her stay, she was a modified max assist due to general lack of motor skills and pain. She was able to reach down and pull up one side of her pants with max assist. All ADL’s were max assist. She was able to ambulate 30 ft. along the hallway handrail with three people attending her. Ms. Dochtermann remembers her first shower as a scary experience tempered only by Angela’s amazing patience and caring touch. Within the first few weeks, Ms. Dochtermann had a more regular PT/OT team lead by Tom and Ana, with assists by Joy, Angela, and Jimmy. Anytime she went downstairs to the Essex gym, she was always greeted with respect, support and smiles – even from professionals like Demeris, who was not her therapist but always had a smile. It was also at this time that Marilyn, with assistance by Nicole in speech therapy, worked with her on her cognitive abilities. Ms. Dochtermann was sure to point out that Marilyn was lovely and always had time for her even outside their therapy sessions. As half of her stay ended, Ms. Dochtermann had increasing right upper extremity, trunk, and right lower extremity strength. Her endurance was improving. Her family was here a minimum of two shifts (4-6 hours) every day. Her attention and memory also improved. Her sitting to standing went from max assist to minimum assistant. Tom and Ana noticed she was gaining confidence in herself and her abilities. Her ambulation increased to mod-assist and was able to walk one step on the parallel bars. ADLs were now at a moderate assist. The third quarter of her stay showed incredible improvements. Ms. Dochtermann cognitively could focus on the task. She had movement in her left wrist and digits. She was now ambulating 50 ft. with a narrow-based quad cane (with moderate assist). She showed active movement in her left elbow and some movement in her left shoulder. Ms. Dochtermann was able to grab and lift a cone from one side to the other! 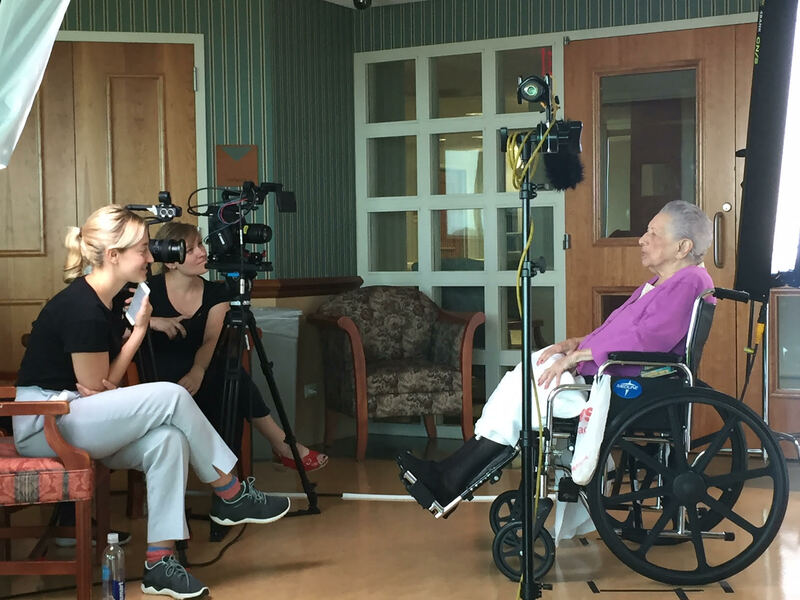 Ms. Dochtermann wanted to be sure to recommend the outstanding care provided by two nurses’ aides, Diana and Gladys. She says it was their gentle but firm care that made her feel safe, and therefore able to focus on her physical recovery. 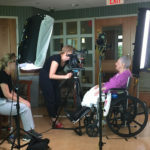 They both encouraged her to perform more tasks on her own and helped her gain her independence. In addition, she was impressed by Adu, a certified nurse’s aide, who’s ten years of experience meant she knew what she was doing. During the last quarter of her stay, the therapy staff continued to educate three key family members and their home health care worker on how to transfer (precautions needed with left arm extremity), walk, perform ADLs, and more. Ms. Dochtermann’s daughter-in-law Christina said, “She learned to really trust Ana and Tom. 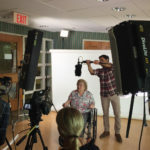 She went from not being able to hold her head up to walking across the entire room, out the door, and to her room!” Within three days of her discharge, all ADLs and transfers went from min assist to contact guard. She was able to ambulate 125 ft. with a narrow-based quad cane. She was able to negotiate three ½ steps and two whole steps with a right handrail. Ms. Dochtermann developed a rapport with Kamal (nurse on the unit) who was always quick with her humor, treating her more like a friend than a patient. 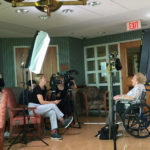 Ms. Dochtermann’s daughter, Elke, observed that Kamal humanized their relationship and successfully transcended a nurse/patient paradigm to one where both parties could accept each other as people, a nuance hard to come by in a busy rehabilitation center. 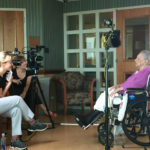 She further stated that all of the staff seemed to give a little something extra, from the special flare from the food delivery employees that took pride in delivering a nutritious meal, to housekeeping, who were always sensitive to the needs of the patient and were quick to withdraw and return later as appropriate. Ms. Dochtermann also thought it worth mentioning, that her room was covered in signs by the end of her stay. Her daughter would write or draw out two sayings, riddles, jokes, or one-liners that were hung on the wall and the window. 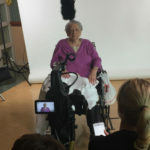 It was intended to help Ms. Dochtermann with her left side visual occlusion that improved during her stay, as well as give her something to think about and thwart her tendency to loop. As the days passed, new signs were added until an entire wall and door were covered. Everyone who went into the room couldn’t help but smile and laugh. 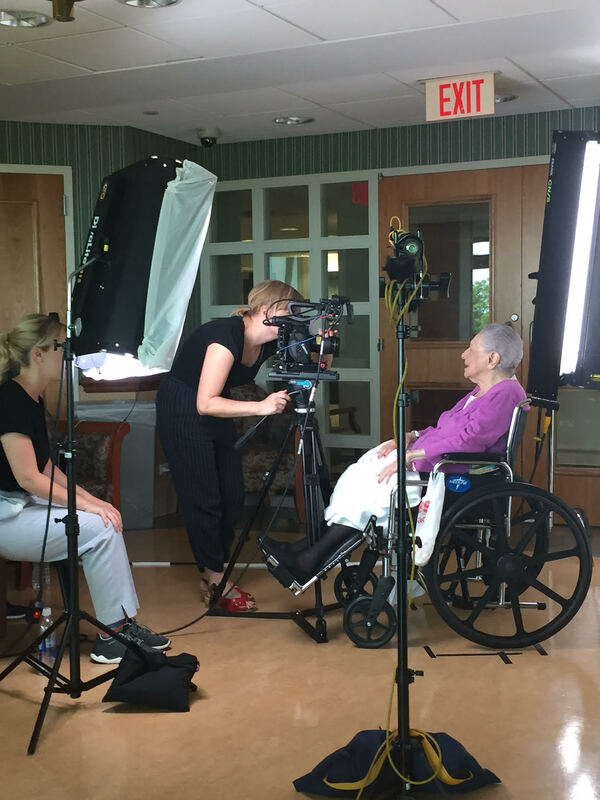 Ms. Dochtermann insists that her ability to laugh, goaded liberally by her daughter, is a driving factor in her rehabilitation. Ms. Dochtermann’s attention, safety awareness, trunk strength, standing endurance, balance, range of motion, and active movement in her upper left extremity all improved by leaps and bounds while here at The Paramount. Upon discharge, home arrangements with Visiting Nurse Association of Hudson Valley were confirmed. Her pain while moving a five out of ten and no pain while still. Christina said, “You all helped her develop from a really terrifying place to a much more capable place.” We here at The Paramount are honored to have given Ms. Dochtermann the care she deserves! Posted in News and Events	| Comments Off on Nursing Home Week 2018! 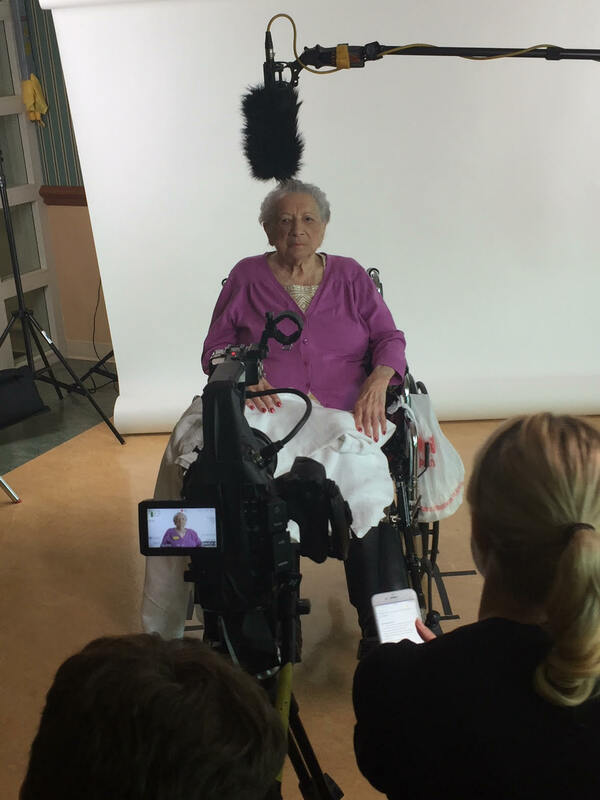 Paramount Centenarians Share How to Be Beautiful in Allure! The Paramount at Somers community is humbled and honored to share that two of our very own residents were featured in Allure Magazine! Jean Castiglione & Jean Renna shared with the fashion giant life advice including that of beauty, romance, fashion, career, spirituality, and much more! For more on this incredible story, click here! 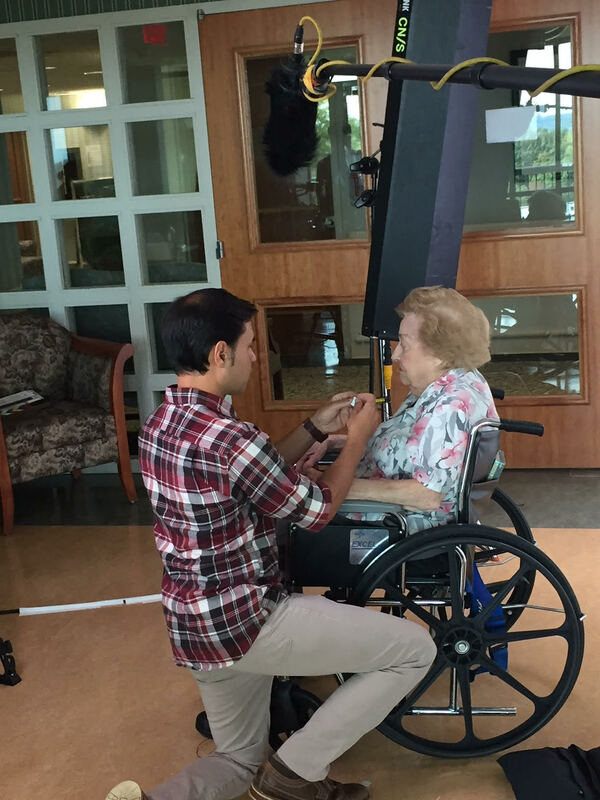 Posted in News and Events	| Comments Off on Paramount Centenarians Share How to Be Beautiful in Allure!